A few days back, I was having a scintillating conversation with my close friend who was very much interested in frugality and financial freedom. I was explaining about the financial illiteracy that is prevailing among youngsters. She silently listened to the complete lecture that I was giving, and raised a million dollar question “Alright, youngsters including me know nothing about money, but where should we start to be financially aware?”. This post is to answer her question, and I thought sharing this would also help other youngsters like her! Firstly, know how much you’re worth financially! If your Net worth is positive value, the you are in less risk. Or, if it is negative value, then try making it positive by fixing liabilities first. Start Analyzing your Spending Trend! Start tracking your monthly expenses- be it your groceries, credit card bills, phone bills, log them somewhere and see where you are over spending. Sketch your own Balance Sheet! 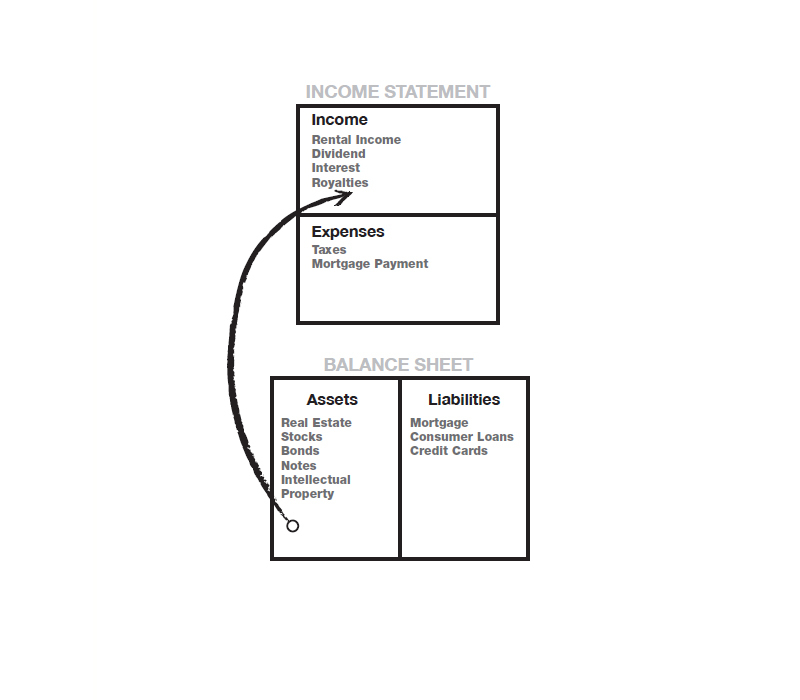 A balance sheet clearly gives you an idea of what you own and owe. 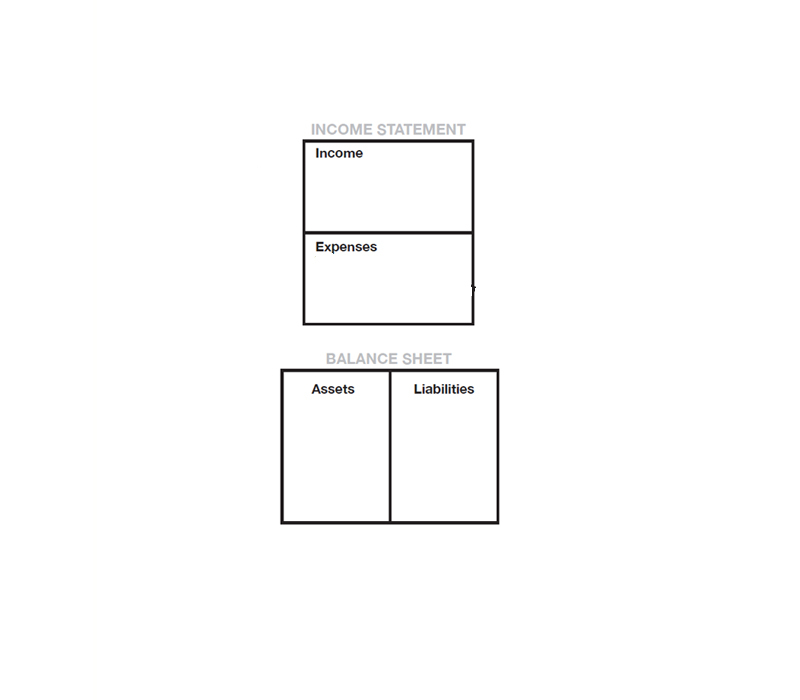 List your income, expenses, assets and liabilities in the appropriate boxes in the diagram below. Assets are the ones that put money in your pocket, and liabilities take money out of your pocket. Once the data is filled inside the boxes, see how the expenses are going out, and draw appropriate arrows by seeing the samples below. 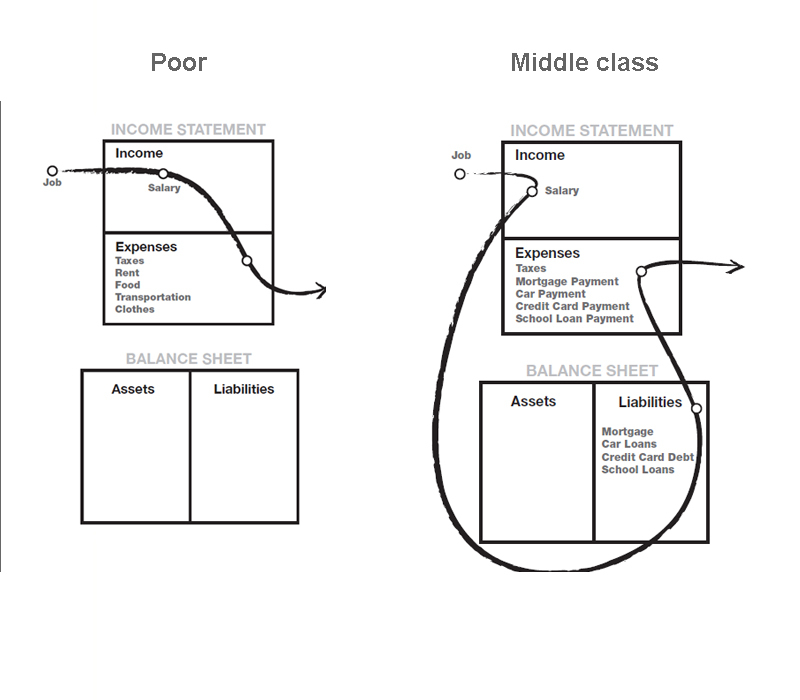 In the first diagram, the income just goes as expenses without any liabilities, there is no asset creation at all. In the second diagram, the income is spent mostly on loan payments and debt, but few assets like home and car are created. So the second diagram is far better than the first one, see where you’re fitting in. Create assets that generate income without you working for it! The following is the balance sheet of the rich. Did you notice how the income stream is generated? The income is generated from the Assets. The money that you’re investing in the assets should give returns, and this is called as Return on Investment (ROI). When the ROI is generated as income, you don’t need a full time job :). Net worth: Why is it important for a common man? Which are the assets in which a middle class person should start investing??? My friend,I would advise to start off with safe investments first like Fixed deposits, Mutual funds and Real estate. Try and analyse how much you’re gaining on each investment, and try to grow your gained money to the maximum. Start reading these books before investing, these books are great for beginners! How to Sell Old Gold Jewelry for Best Price? How to calculate monthly Take Home Salary in India (Excel calculator inside)! 3 Powerful TED-Talks that completely changed my life! Can Housewife Make Money Online in India with ₹0? In response to answer the most frequently asked question “How to make money in India sitting at home as a housewife?”, I’m writing this post to help thousand’s of Indian Women to stand financially independent…. After reading Napolean Hill’s book ‘Think and Grow Rich’, a famous book on Success, I decided to read atleast one quote of his daily. So I quickly created a handful of wallpapers to read daily…. Recession: Why Does it Happen? If you had told me four years ago that I would one day write about ‘Recession’, I would have laughed in your face. Most people learn financial literacy when they have to. I’m no different….